“I asked if she received the letter. She said she had. I asked her if she would loan me a sum of money to be paid back monthly and I was going to open a bakeshop. “He is my brother. I told her that he was poorer than I was. “I told her I was different from the others. “She says: ‘You wait here’ and she went in the hall and she came out again. I was standing up. “She came over toward me and I says: ‘Who did you ring up? “At the same time, she placed her hand in her vest and I moved to the left…. “And she says: ‘Put down that gun’ and she turns and says ‘Go back, he has got a gun’ and she would not put her hands up. …. “She fell and I said something over the body. I don’t remember what. 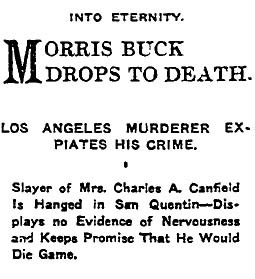 Morris Buck was convicted in the Jan. 27, 1906, slaying of his former employer, the wife of Charles A. Canfield, an oil executive and partner of E.L. Doheny, at the Canfield home at 8th and Alvarado. According to The Times, Buck shot her once after she refused to loan him $2,600, and her young daughter screamed and ran into the house. 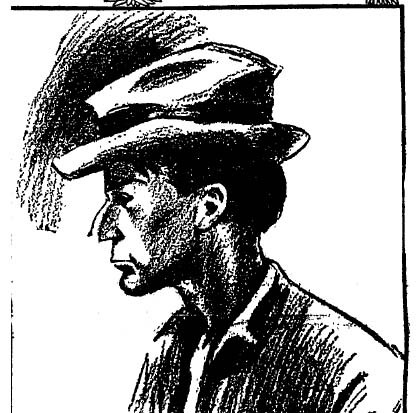 The wounded woman wrestled with Buck as he shot her again. Buck claimed that he was insane, having once been kicked in the head by a horse. He had been held in the mental ward at the County Hospital for two months in 1903, but the insanity plea was rejected as a ruse. An expert on Bertillon criminology said: “Buck is one of the most interesting criminals I ever saw. I do not believe he is insane; he is, in my opinion, a low degenerate from the effect of vicious personal habits. “A few moments before the time set for the execution, the warden entered the condemned cell and read the death warrant. Buck’s hands were then strapped to his sides and the march to the gallows was begun at 10:50. Warden Hoyle took the lead, then came the priests, chanting prayers for the dying and following came the condemned man, a guard on each side. “He then stood upon the trap. Guard Albrogast placed the rope around his neck, drew the black cap, the signal was given and his body dropped. In an interesting footnote, five of Canfield’s children received $500 a piece from her estate. Another woman named Hattie Elizabeth Bryant or Dorothy Canfield was given $5. “It is not my desire that she be recognized as one of my children,” Canfield’s will said. Years later, it was revealed that Dorothy was a foundling taken in by the Canfields. In 1917, the five Canfield daughters, as trustees of $100,000, sought to sell their late father’s real estate to establish a school for girls. In 1933, daughter Daisy Canfield Moreno died when the car in which she was riding plunged off Mulholland Highway on her way home from a late-night party at the Beverly Wilshire Hotel. In 1972, the Canfield Foundation dissolved, giving $700,000 to Mills College and $1 million each to Pepperdine and Stanford. And nowhere, in any of these news stories, do we learn Mrs. C.A. Canfield’s first name. It is almost beyond belief. 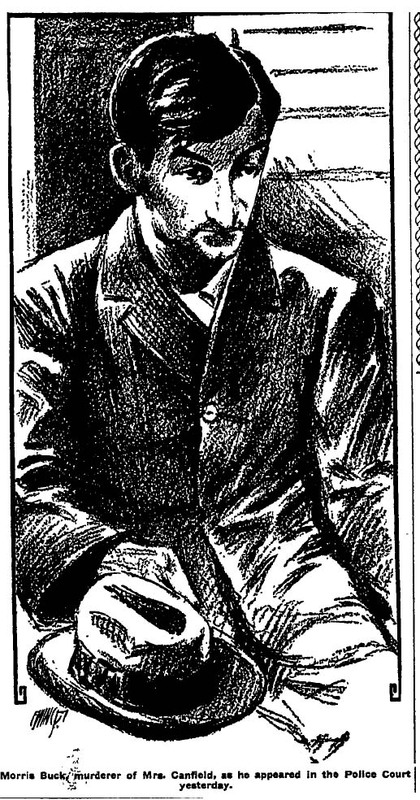 This entry was posted in 1907, 1908, 1911, Crime and Courts, LAPD, Streetcars and tagged 1907, Charles Canfield, crime and courts, homicide, lapd, Morris Buck. Bookmark the permalink. Daisy Canfield Moreno was the wife of extremely hot actor Antonio Moreno, and was in the car with a young man named Rene Dussac when they crashed (her survived). Daisy must have had more “It” than three Clara Bows!